Evita comes to the Open Air Theatre, summer favourites like the Notting Hill Carnival and Kids Week return and Mamma Mia! The Party previews at The O2 in August 2019. Jamie Lloyd directs the moving musical about the rags-to-riches rise of Eva Peron. Jamie Lloyd directs Tim Rice and Andrew Lloyd Webber's Evita as the musical comes to Regent's Park Open Air Theatre, concluding the 2019 season. The musical premiered in the West End in 1978 and features a chart-topping score including Don't Cry For Me Argentina, Oh! What A Circus, Another Suitcase in Another Hall, and the Academy Award-winning You Must Love Me, originally performed by Madonna in the Oscar-winning 1996 film. As Artistic Director of The Jamie Lloyd Company, Jamie recently produced and directed the starry Pinter at the Pinter, a season of Harold Pinter's short plays in the West End with Tom Hiddleston, Lee Evans and a string of celebrities among the cast. Cycling for top level pros, keen cyclists and fund-raising, fun-loving two-wheelers. Smartly-dressed cyclists line up for a Le Mans style start as the competition unfolds. The annual Brompton World Championship comes to central London this summer, tying in with the Prudential RideLondon cycling festival. The London event takes the form of a Le Mans style start as 550 smartly-dressed competitors (strictly no Lycra) make a mad dash to unfold their bikes before setting off on the 16km circuit which starts on The Mall and covers eight laps around St James' Park, past Buckingham Palace before finishing back on The Mall. Given the cult-like nature of these much loved folding British Brompton bikes, it's no surprise that this has become a hugely enjoyable, somewhat eccentric event with prizes for fastest team, best veteran riders and the best dressed cyclists. The family friendly part of RideLondon opens up London's traffic free streets. Britain's biggest bike festival, Prudential RideLondon, gets under way with the RideLondon FreeCycle, a family friendly event in which around 70,000 riders typically take part. An eight-mile loop through the traffic-free streets of central London - with bands, music bikes and stilt bicycles along the way - the route takes in some of London's most iconic sights, with participants free to stop and start, take photos and experience the fun and freedom of riding without worrying about cars, lorries and buses. From Tower Bridge to Buckingham Palace and the Houses of Parliament, London's greatest sights will create an inspiring backdrop for a memorable day of cycling - and if you finish and want some more, then simply ride the route a second time. The FreeCycle is part of a weekend of cycling which includes the Brompton World Championship, RideLondon GrandPrix, the RideLondon 100 and RideLondon Classic for the pros. Weekend rave with a pool party run by Ibiza Rocks. Returning to Morden Park, Eastern Electrics is a weekend rave with a pool party run by Ibiza Rocks and a VIP area by Ministry Of Sound. Expect an Ibiza summer vibe, lasers and smoke cannons, upfront house and techno, big beats and a crowd of around 17,000 people up for a party. This year's festival welcomes London boy Skream who brings his fresh 'I Feel' brand to the Big Top. Defected, step up to host another EE mainstay, The Switchyard - the industrial stage, made up of shipping containers. New for 2019 is The Plant House, a summery arena filled with lush, leafy plants and a see-through roof letting the sun stream through at this summer weekender, filled with hip-hop, bass, garage, top-spec production and pyrotechnics. This year's line-up includes Black Panther, This is England and Clueless. The most famous of all the open air film events in London, Film4 Summer Screen returns to Somerset House to bring cinema lovers a truly eclectic mix of outdoor movies. This year's line-up includes the Oscar-nominated Black Panther, '90s comedy Clueless, love story God's Own Country and Shane Meadows' This is England. As well as the evening's feature film, there are DJ sets inspired by the main event, al fresco picnics and a fabulous summer vibe. Additionally, Behind the Screen presents panel discussions and conversations from industry insiders who are shaping the world of cinema today. The festival returns with a bigger line up of 80 breweries, talented chefs and DJs for three days of fun. The London Craft Beer Festival returns for its seventh year in 2019 returning to Tobacco Dock with a bolstered line up of 80 breweries (much bigger than last year's 50), close to 500 different beers on tap, talented chefs and hot DJs for three days of fun. New York based breweries and new European breweries, including Brasserie Popihn from central France and Cerveja Letra from Portugal, join UK craft beer makers Northern Monk, Pressure Drop and Kings Cross based Two Tribes and Bohem. This year's festival sees the debut of the world renowned Copenhagen restaurant Amass as Matt Orlando and his team showcase beers from their new brewery Broaden & Build. Topping off the weekend will be the festival's curated selection of food and music. Luca, Pitt Cue and Gunpowder have appeared at the festival before with Two Door Cinema Club and Toddla T previously playing. This year's lineup will be revealed later. An all-day party soundtracked by Artwork and DJ Harvey. For the second year in a row, Art's House takes over Three Mills, a lovely patch of greenery between Bow and Stratford, for an all-day party soundtracked by two London DJs, Artwork and DJ Harvey - "A libertine Englishman turned California surfer dude," says Rolling Stone who named him one of the world's 'Top 25 DJs that Rule The Earth'. Set in an industrial area enclosed by the Lee Valley river, it's the ultimate East London spot to throw a big ol' party. Festival-goers can expect Art's vivacious troupe of dancers, mouth-watering street food, cold craft beers, summer-inspired cocktails and a horde of home comforts (Artwork's front room sofa among them). DJ Harvey says "It's like the best house party ever but with 10,000 people in the garden. Having a right kneesup." A multi-sensory festival featuring the best desserts from across the UK. Calling all sweet tooths: the first London Dessert Festival comes to the Truman Brewery this August. 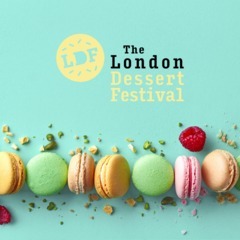 Presenting the best desserts from across the UK, the multi-sensory festival will be full of experimental ways to celebrate and enjoy the sweet treats. Visitors can expect a number of interactive features such as themed rooms and Instagrammable walls along with indulgent treats like Macaron ice cream sandwiches, Frozen S'mores, Cookie Shots, Cereal cocktails and more. Forest parties and house tunes at one of London's most vibrant summer music festivals. After two successful years at Queen Elizabeth Olympic Park elrow Town moves to Trent Park, in north London, on Saturday 17th August 2019 for a bigger, one-day-only party. In the vast, lush green setting, there's space for forest parties, queer dance troupe, wonky races, town trains snaking across the fields and all round elrow extravagance. Promising to add the wackiest town to the London map, this is a party populated by over dressed up 200 characters while more than 50 DJs deliver the phat house and techno anthems, ensuring that elrow Town London ranks as one of the capital's most vibrant summer music festivals. Last year, Fatboy Slim, Paul Kalkbrenner and Idris Elba were on the bill so you can expect a strong line-up from a festival that's grown from being a club in Barcelona into a moveable club event with residencies in Ibiza, Madrid and Amsterdam. Craig David and Chase and Status headline the two-day electronic music extravaganza. A firm favourite on the London festival calendar after 15 successful years, South West Four is back on Clapham Common for two days of dance music and big names over the late August Bank Holiday weekend. Martin Garrix, Craig David and Chase and Status headline the two-day electronic music extravaganza. On Saturday Martin Garrix and Tinie Tempah are the main stage headliners while Craig David presents TS5 Takeover at the indoor tent. They're supported by a strong lineup of Basement Jaxx (doing a DJ set), UK House star James Hype, highly popular songstress Mabel, and Heldeep Records head honcho Oliver Heldens. South London rap star Yungen, and Sigma, returning after mesmerising 30,000 fans at the festival last year, also put in an appearance. Sunday sees Plan B on the main stage outside while Ms Dynamite sings live and Chase & Status presents RTRN II JUNGLE indoors. Expect many stars of the global dance scene, filling Clapham Common with revellers united in the knowledge that they don't have to get up for work the next day. The festival finishes around 11pm but there are after-parties for those keen on all-night revelry. Europe's biggest street party brings the Caribbean spirit to west London. Held since 1966, the Notting Hill Carnival was originally a local affair for west London's homesick Caribbean community, this has evolved into Europe's biggest street party. Carnival sets London on fire in a blaze of Caribbean spirit as extravagantly costumed dancers, calypso and soca musicians, giant sound-systems and steel bands are joined by over a million revellers of all ages. Sunday is officially children's day, but there are loads of kids on both days enjoying the bright colours of the floats and the dancers' feathered costumes. Adults can shake their booty at dozens of stages and there are tunes for all tastes, from house to hip-hop. It's a huge area and can get very crowded, so be prepared for an exhausting day out, but for anyone who loves a party, carnival remains the absolute highlight of the London summer. 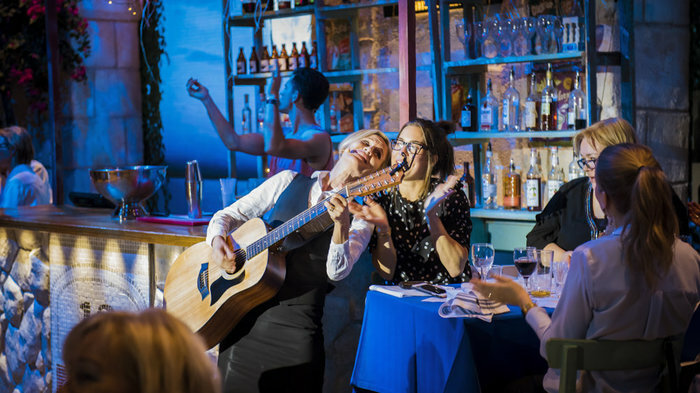 The immersive Mamma Mia! experience with a script by Sandi Toksvig. Be immersed in the world of sunshine and ABBA songs as Mamma Mia! The Party comes to town, co-produced by Bjorn Ulvaeus himself. Set on a Greek island, you'll sit at tables in the taverna's courtyard, enjoying Mediterranean food and drink while seeing the theatre - which follows a script by Sandi Toksvig - unfold. It's as if you've been invited to the afterparty for Mamma Mia! so you'll get the chance to dance along to ABBA songs. The immersive experience takes place in one of the venues within The O2 which has been transformed into Nikos' Taverna, designed by Steve Tompkins of Haworth Tompkins architects. You'll certainly feel as if you've been whisked away to the island of Skopelos, amongst olive trees and bougainvillea. It's already proved a huge hit in Stockholm where it first opened in January 2016 and is now in its third sold-out year. A food festival dedicated to our favourite weekend meal. A food festival dedicated to our favourite weekend meal, somewhere between breakfast and lunch, London Brunch Fest takes over The Old Truman Brewery for a whole weekend this summer. A number of headline restaurants will be taking part, bringing together London's best menus under one roof to serve everything from avocado on toast to American pancakes. Expect both coffee and booze to wash it all down with as well as a programme of workshops, talks and music. From cheap budget hotels to luxury 5 star suites see our deals for hotels, including The Nadler Hotel Kensington from 36% off.